Less than one day into its iTunes debut and Leapin’ Leprechaun lite has already garnered the highest respect from many gaming experts. 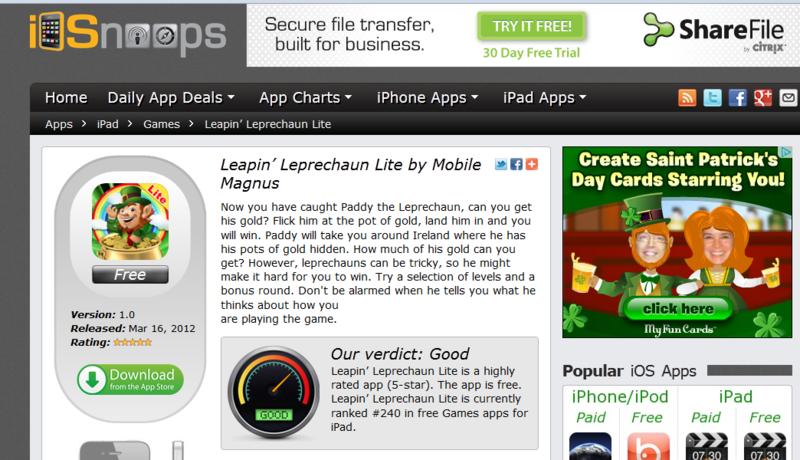 This St. Patrick’s Day, the game has been name the #1 top iPad game app pick by those in the know. The results are in and Leapin’ Leprechaun, a new iPad game on iTunes, has earned the distinction of being the top gaming app pick for St. Patrick’s Day. The ranking is the result of a tabulation of the web’s most influential app-dedicated bloggers, tweeters, reviewers and site owners. According to NPD Group, there are now more than 16,000 games in the Apple App Store and a whopping 100,000+ apps overall. With long-established giants like Angry Birds continuing to land in the most downloaded spots, standing out from the crowd and cracking into that elusive must-have list is difficult for new game entrants. With so many apps to choose from, it is even harder for iPhone and iPad users to distinguish which apps are worth their time. As one Sitepoint writer posed a few years back, “But how many of those iPhone applications are worth your time? With so many vying for attention, how does one sort out the fluff from the worthwhile apps?” That’s where influential app-dedicated bloggers, tweeters, website owners and app review sites have become an invaluable resource. 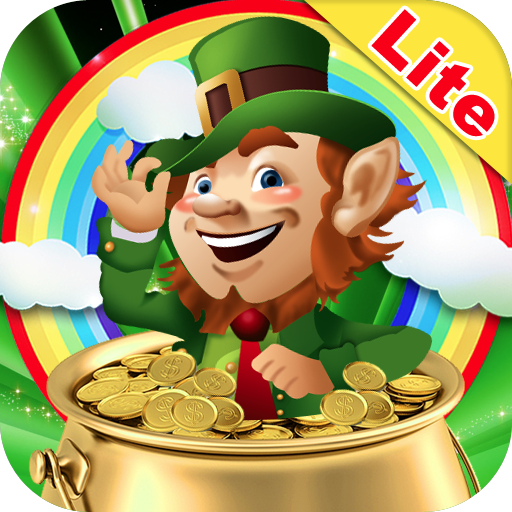 And this St. Patrick’s Day, those online influencers have chosen, by a landslide, the new game Leapin’ Leprechaun Lite as their number one iPad game app pick. Lead developer of the game, Mobile Magnus’s William McCarthy of Cork, Ireland, couldn’t be more thrilled with the accolades. “Leapin’ Leprechaun has only been available through iTunes for one day. To have earned the respect of so many app reviewers so quickly is humbling,” he said upon hearing the news that the game had secured the top recommendation spot on many blogs, Twitter and Facebook accounts. 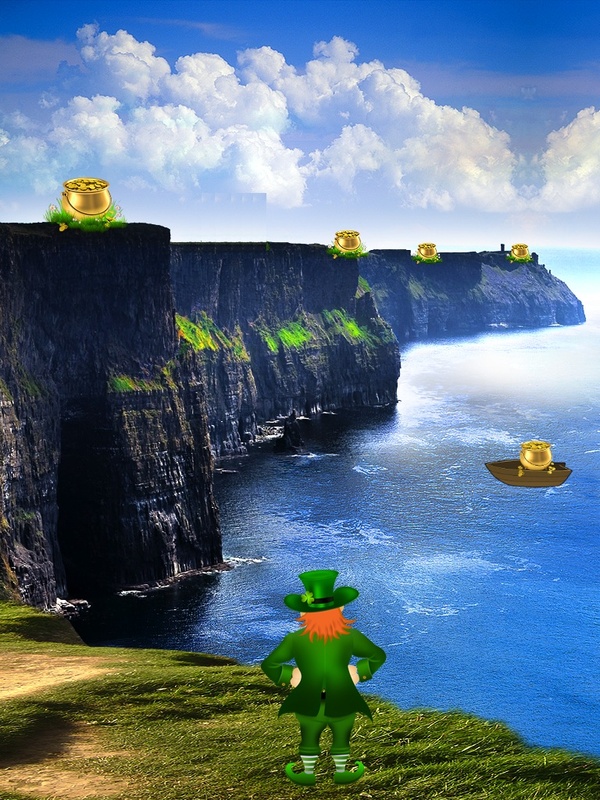 To see the game graphics and rules that have earned Leapin’ Leprechaun Lite its highest respect, visit http://itunes.apple.com/us/app/leapin-leprechaun-lite/id510916059. Social networking, Apple gaming and iPad app reviewers who are late to the St. Patrick’s Day parade can find information they need to spread the word about the game at http://leapinleprechaun.com.